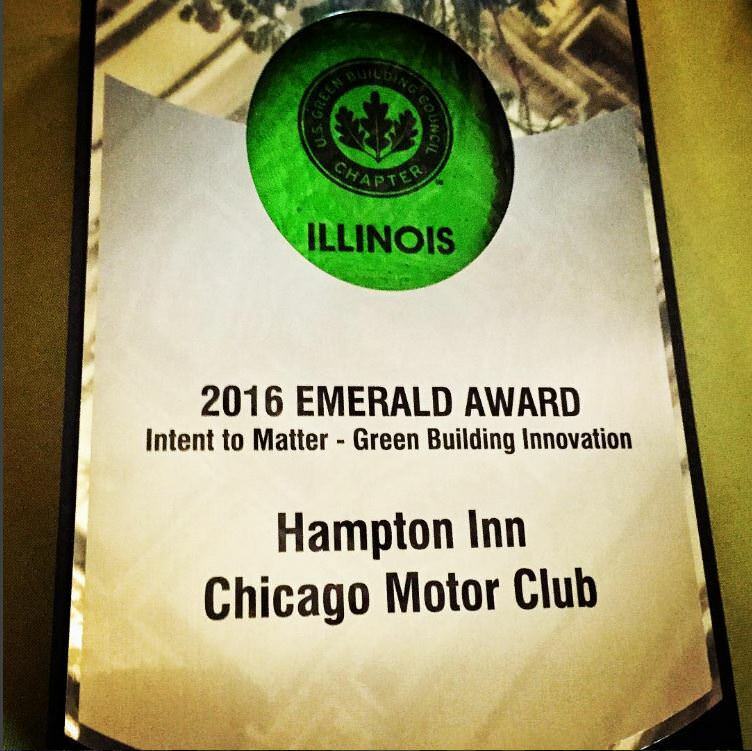 The Illinois chapter of the U.S. Green Building Council (USGBC) honored the Hampton Inn (Chicago Motor Club) at the organization’s annual Limelight Celebration. The hotel was one of three projects recognized with an Emerald Award for Green Building Innovation. The Emerald Awards ceremony was held on June 23rd at the Chicago Cultural Center, during USGBC-Illinois’ annual Limelight fundraiser. Governor Bruce Rauner opened the event with introductory remarks, followed by presentation of the awards to the winning projects, organizations and individuals. HPA’s director of preservation, Paul Alessandro, conferred the award for the Hampton Inn (Chicago Motor Club) to owner/developer Murphy Asset Management. Alessandro commended Chairman John Murphy and the design and construction team for embracing the challenges of not only transforming the landmarked Chicago Motor Club skyscraper into a unique hospitality destination, but also modernizing its systems for efficiency and achieving LEED Certification. The U.S. Green Building Council is a national non-profit that advances buildings and communities that are sustainable, prosperous and healthy via education, advocacy and collaboration. The Illinois chapter has hosted the Emerald Awards competition for 11 years to showcase the best and brightest contributors to a more sustainable built environment. To view the complete list of the 2016 Emerald Award winners, click here.